Zinedine Zidane is back at Real Madrid 284 days after his shocking resignation. Real Madrid have re-appointed Zinedine Zidane as the Real Madrid boss, 10 months after he shockingly resigned as the Los Blancos manager following the Spanish giants' third successive Champions League triumph in Kiev. Since the departure of the Frenchman, there has been nothing but misery surrounding the Santiago de Bernabeu. Following a UEFA Super Cup defeat at the hands of their eternal rivals, Atletico Madrid, at the start of the season, the story has been the same for the Royal Whites throughout the season. Santiago Solari took over the Madrid job from Julen Lopetegui midway through the season. However, the Argentine couldn't turn the 13-time European Champions' fortunes. Recently, the Galacticos ruined their season within a week as they were knocked out of both, Copa del Rey and the UEFA Champions League. On the other hand, they currently occupy the third spot in LaLiga table - 12 points adrift of the leaders, FC Barcelona. In the wake of the events, Real Madrid hierarchy decided to sack Santiago Solari and re-appoint Zinedine Zidane with a view of overturning their fortunes. During his helm at the Bernabeu, the Frenchman delivered nine major titles, including three Champions League and a LaLiga title. Maintaining a laudable record, the Frenchman won 104, drew 29 and lost just 16 matches during his two-and-a-half year-long span at the Bernabeu. "The Board of Directors of Real Madrid, meeting today, Monday, March 11, 2019, has decided to terminate the contract that linked Santiago Solari with the club as coach of the first team and, at the same time, Real Madrid has offered to continue belonging to the club. "Real Madrid appreciates the work done by Santiago Solari and the commitment and loyalty he has always shown to this house. "The Board of Directors has also agreed to the appointment of Zinedine Zidane as the new coach of Real Madrid with immediate incorporation for the remainder of the season and the next three, until June 30, 2022. 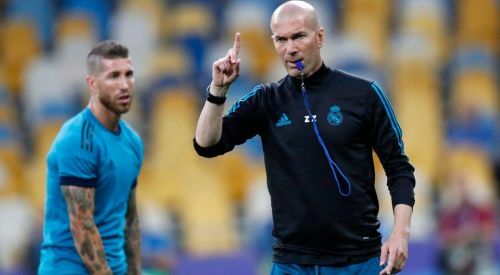 "The president of Real Madrid will appear today with Zinedine Zidane before the media at 8:00 pm in the press room of the Santiago Bernabeu stadium." Despite returning just 10 months after leaving, Zinedine Zidane is facing a 'rebuilding job' at Real Madrid.